Amandine Affagard received her first guitar lesson at six years old in Bordeaux (France). From 2006 to 2011, she studied at the Conservatory of Marseille with Raymond Gratien and then at the Haute Ecole de Musique in Geneva (Switzerland) with the composer Dusan Bogdanovic. 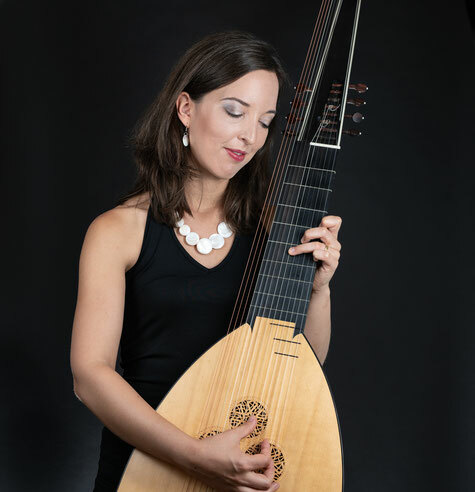 She graduated with a “Bachelor of Arts” in 2013 and did an Erasmus- Exchange at the Hochschule für Musik Franz Liszt Weimar (Germany) with Prof. Thomas Müller-Pering and Björn Colell where she received her first theorbo lessons. In February 2017 she graduated with a “Master of Early Music” (theorbo, lute and baroque guitar) at the Universität der Künste Berlin. She won among others the “Prize Pierre Barbizet” at the Bach Competition in Marseille, the First Prize at the “Clés d’Or” Competition in Paris, was awardee of the Lions Club in France, of the Foundation Ad Infinitum, of the Paul-Hindemith-Gesellschaft and of the Live Music Now Yehudi Menuhin E.v. She was invited to the International Feminist Art Festival Berlin, the 8th Guitar Festival Cuxhaven, the Festspielen Meklenburg-Vorpommern and the 45. Istanbul Music Festival, participated in projects in many concert and opera places (Berliner Dom, Residenz München, Neuköllner Oper,...) and collaborated with renowned ensembles like Musica Sequenza and the Ensemble Baroque de Limoges under the direction of Christophe Coin.